In the past two years, EPCOR invested CAN$1.2 million in the design of a water- and land-related utility system to create, update, manage, visualize, analyze, and share spatial data. The new system needed to maintain consistent user experience, functionality, graphical user interface and system availability. MicroStation and Bentley Map were the applications selected to build the application. EPCOR needed to stay with the same database technology with little or no changes to the existing data model. Data analysis, querying, reporting and visualization for engineers, maintenance and operations crews, project managers and coordinators, communications coordinators, financial analysts. Data capture, data storage managed by drafting technologists and system analysts. MicroStation was introduced in 2005 and Bentley MicroStation Geographics and Bentley Power Map were introduced later. Construction drawing preparation now includes specific map elements, and extraction of elements takes a matter of minutes instead of hours. Shepel said they have three core business processes implemented on one platform recording, drafting and field mapping. 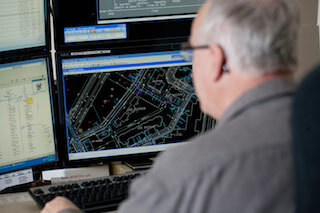 They are experiencing increased efficiency in recording assets, ensuring that data remains valid, logical and precise. EPCOR has implemented QA/QC rules that maintains data validity and accuracy, improved processes used to support capital projects, improved data for use in other apps i.e. MapInfo and SynerGEE, more accurate and timely awareness of infrastructure status, improved data accuracy, currency and consistency. Using an eSpatial iSmart system integrating Ivara with EPCOR’s GIS, users should have access to data when they need it in a format that meets their needs. Business processes drove the solution, not the technology, delivering the right tool at right tool at right time. This entry was posted on Wednesday, January 15th, 2014 at 9:30 am. You can follow any responses to this entry through the RSS 2.0 feed. You can leave a response, or trackback from your own site.